After paying respects to the Salvation of the Roman People icon at the Papal Basilica of Santa Maria Maggiore (a.k.a. Our Lady of the Snows), Pope Francis’ ecclesiastical entourage took an unexpected detour. The newly elected Argentine pope asked his driver to circle back to the Domus Internationalis Paulus VI, so that Pope Francis could collect his luggage. 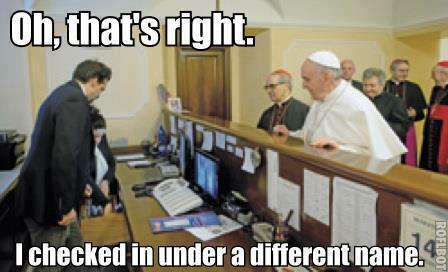 After he collected his things, the prelate went to the front desk of the Vatican run boarding house to thank the staff. Then Pope Francis insisted upon paying his bill. Most people might have understood had the Pope had.left the Church pick up the 85 Euro a night tab for a complete pension, he insisted on trying to pay his way to set a good example of what priests and bishops should do. It is unclear how much Pope Francis actually paid. Moreover, it is humorous but dubious that he claimed that he checked in under a different name. This pied-de-terre episode certainly solidifies Pope Francis’ reputation for frugality and fraternity with common folks. But it may symbolize some of the new Pontiff’s ambitions to challenge the comfortable situations of the Curia and dispel the anti-clerical slight that the Church lives high on the hog on their parishioners’ tithes. 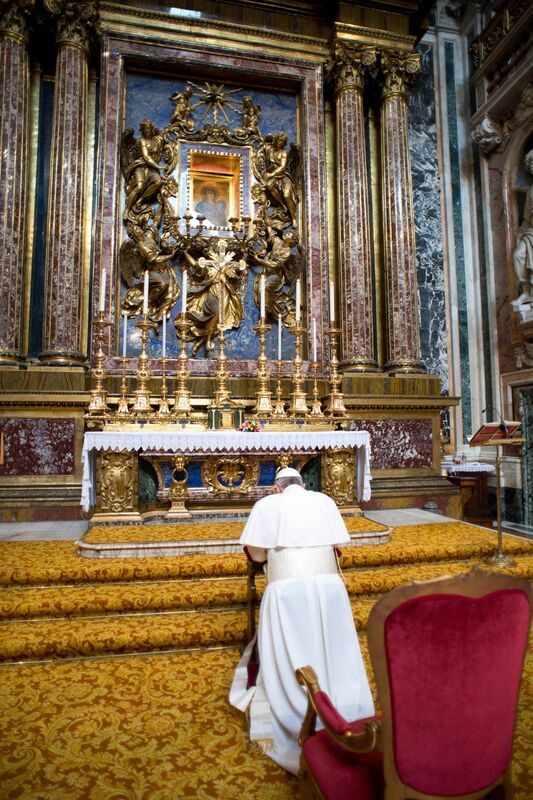 The early trip to Santa Maria Maggiore may also herald another important aspect of Pope Francis’s papacy. New Popes are expected to visit all five of Rome’s patriarchal basilicas early in their reign. Moreover, many recent pontiffs, especially Pope Blessed John Paul II, have major Marian devotions. 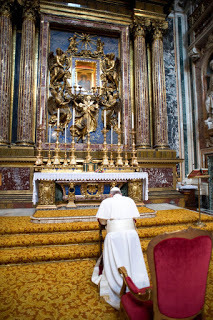 It is telling, however, the on the morning of his first full day in the chair of St. Peter that Pope Francis visits Salus Populi Romani and also brings flowers. This icon is of particular significance to Romans. For example, when Rome was going to fall from Axis control in World War II, Adolph Hitler vowed to bomb the Eternal City to smithereens. Pope Pius XII arranged a procession of the Byzantine Salus Populi Romani through the streets and miraculously a fog enveloped the city, so the angry Nazi bombs only fell on a Roman cemetery. This humble act continues Pope Francis identification with his new Roman Diocese.